Hi Everyone! What have you been cooking up in the kitchen? I did a whole class on grains with Jason this last Thursday, finished the meal service for this week, and now I am going to get started making the cupcakes. What cupcakes? I am catering a wedding and a reception. 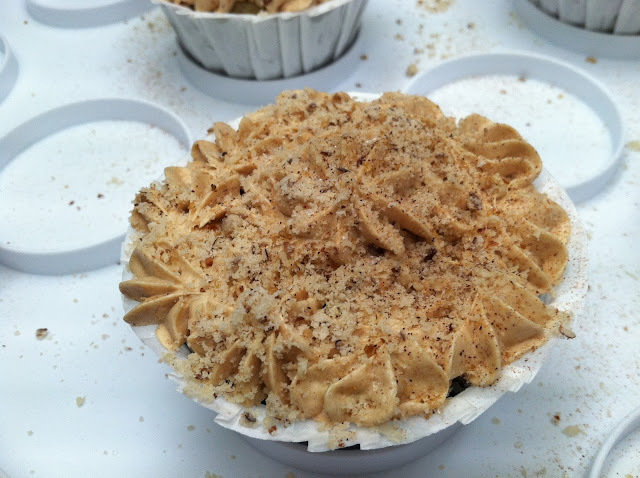 All told, I developed 7 new cupcakes, including the one pictured – Almond Mexican Vanilla Burbon. The filling is a cinnamon Mexican vanilla flan, the cupcakes have ground almonds as part of the flour, and the frosting is cinnamon Mexican vanilla. Now anyone who wants to tell me that vegan food is tasteless can officially kiss my… cupcakes. My students want to know if you would be willing to make these (or similar ones) for them. I said I would ask and see how much it would cost for 30 cupcakes. Ha Ha! You know I will hook you up, girl!